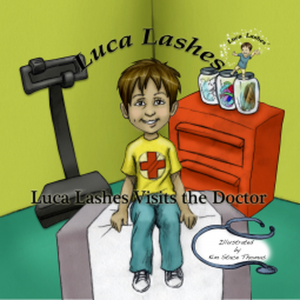 luca lashes | Search Results | "A Stitch in Time"
As usual, a children’s advance release we have the kids review the book! These are some of my favourite reviews to do! Enjoy! Trinity: The book was pretty. It’s nice. I learned about going to the doctors and getting his shots. Emanuel: The book told me I should not be afraid when I go to the doctor! I had shots before. It was not scary, just hurt a little bit too. It stinged a little bit when they put the band aid on. Gavin: It was cool. The art looked pretty. It must have been a little scary. The book taught me not to be afraid of shots. Zander: I liked the book. I know that it kind of stings but you should not be afraid. It was a very cool book and had lots of art in it. I personally like that there are some tips to the parents at the back of the book. Ideas as to how YOU can make going to the doctor easier (a lot are common sense really and a little late for our family as our firsts were born and lived in the hospital for 7 weeks with tons of follow ups so a doctor is nothing new). I thought the art and story were fun and bright. I am not sure that the kids realized that his lashes were magic but they took so much out of the story that I don’t know that it mattered. If you have a nervous child on the way to the doctor this is a great read! And we all know, a calm and ready child is so much better than a fearful one!